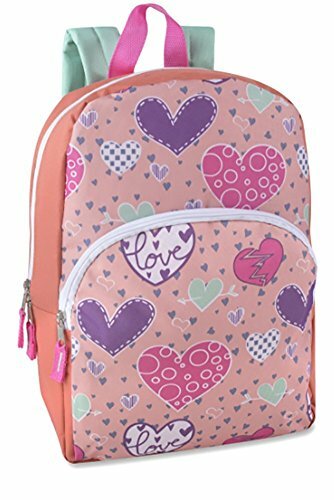 Toddler Kids PreSchool 15-inch Printed Backpack, Many Prints Available for Boys or Girls is made from strong 600D Polyester. The backpacks feature padded adjustable straps for a custom fit on your little one. Measuring 15x11x5, this backpack is perfect for your toddler or early education child. Designed a front pocket large enough to hold a pencil case or small lunch bag, this backpack has everything your child will need to start off their schoolyear on the right foot. Designed for little kids who always want what the big kids have, our toddler backpack has fun colors and time-tested construction, because packing treasures around the backyard can sometimes be just as important as carrying books and homework to school. COMFORT: This lightweight schoolbag features padded adjustable straps for a custom fit on your little one's back. DETAILS: Crafted from strong 600D polyester, this backpack is sure to last the entire school year. The backpack measures 15x11x5. It features a large front accessory pocket, suitable for a pencil case or small lunch bag. Designed for little kids who always want what the big kids have, our junior backpack has fun colors and time-tested construction. Main compartment has ample room for a lunch box, a few toys and an extra set of clothes. If you have any questions about this product by Bags in Bulk, contact us by completing and submitting the form below. If you are looking for a specif part number, please include it with your message.